Famous for his quick fire one-line gags Mr Vine’s comedy is very cheesy, but the type that is hard not to laugh at. On TV he was also a regular in Not Going Out, a BBC comedy by Lee Mack. In 2004 Tim went in to the Guinness World Record Book for the most jokes told in 1 hour. He managed 499 which is quite ridiculous. What is even more ridiculous is that it was broken by an Aussie 7 months later who managed 549! However, the Australian read his jokes off paper, whereas Tim performed his from memory. If you like this comedian he has quite a few DVDs you can get, including Joke-amotive. And if you want to see him live don’t forget to keep an eye out for his latest tour dates. Here is a list of some good ones. I was working in to a health food shop. This bloke walked in he said evening primrose oil. I said Miss Divine to you. Let’s list 5 fun fast facts! He was born on March 4th in 1967 in Cheam, Surrey, England. Tim has been featured in television, music, theatre, and has also contributed to books. His television appearances date back to the 1990’s with the show Whittle. He was also in a band with his brother, called The Flared Generation. The funny-man broke the Guinness World Record for the most jokes told in one hour with 499. Each joke told had to get a positive response to be counted. 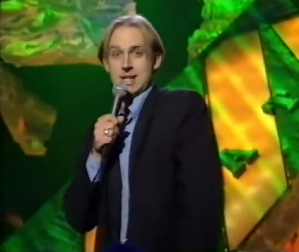 He made this milestone in 2004 and held the record for seven months until an Australian comedian out-joked him by 50. He supports Sutton United F.C., is an avid darts player and a fan of cricket. They sure were fun fact weren’t they! 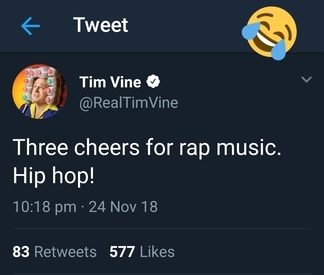 If you want to see Tim’s latest giggles you can follow him on Twitter, his handle is @RealTimeVine, here is an example of one of his comical tweets.